Welcome to my wildlife blog - I will chronicle my exploits looking for wildlife in the UK and post links to trip reports from further afield. I have plenty of target species this year from Wildflowers to Ladybirds and plenty of things in between and tracking these down will keep me busy. I will be doing plenty of mammal watching and there will be some twitching in the mix as well which should keep me out of trouble - hopefully! and all this will be fuelled by lots of Chips and Ice Cream. A brief after work visit into Suffolk for some special plants, grape hyacynth always nice to see but the prize was wild tulip, three in flower. It is not unusual having mice in my garage but there is one in a wall space at home, I set a few Longworths in my Garage and near the wall and one had a capture of a nice yellow necked mouse. He went for a photo shoot and was let go outside the village and nothing since so he was the culprit. I was heading home from Heathrow but took a detour via Ivy Hatch in Kent to see the impressive display of American Skunk Cabbage which was flowering nicely, not too much else apart from a few common plants so I headed for home. I was heading to Heathrow for a flight to the USA, but took a detour via Stirtloe for drooping star of Bethelehem which was flowering nicely, as were some white flowered sweet violets, blackthorn, lesser celandine. My last stop was just a quick one in the Chilterns, where some spurge laurel was flowering in a churchyard. I finally got the moth trap out and caught a few moths, oak beauty the best of a small catch. Toad numbers at my toad crossing continue to drop due to development of their route to breeding ponds but a few were out tonight. I was in Derbyshire for a couple of days not nature related stuff but managed a quick look for a couple of plants, the first on Friday was hutchinsia which was on an exposed hill in an incredible storm, I was on hands and knees as the wind was so strong and the plant so small. I found one but could not photograph it or the common whitlow grass/ also present and the only plant that was sheltered was a rue leaved saxifrage. The second was Merezeon which I had to battle with snow and hail but fortunatly the wind was not too strong and I could at least get a few photos. With my escapades to Shetland I had a backlog at work so spent most of the day there, but on the way home I popped into Cambridge. I easly located purple toothwort which I have seen before then tried for Butterbur which was a little harder to fine but I did locate some afte 10 mins searching. There was a sign detailing its location which I stumbled upon later! I took a quick look for water voles I found one briefly but as the black clouds arrived I headed back to the car and home. I met up with a small group to so a botany search of the Mousehold Heath area of Norwich. The weather was not ideal with strong wind but the rain mostly held off. We found 46 plants in flower mostly common species and a few naturalised ones, including Petty spurge, sun spurge, white comfrey, alexanders, charlock. I popped into Cherry Hinton on the way home but all I could find was some stinking hellebore. After a quick bus ride back to the airport and purchasing the car back from Long stay parking we were off into Glenshee, some goosander along the river of note. Glenshee ski area was cold, windy and with heavy sleet / snow it made searching for ptarmigan difficult. But we did find a group of 5 and a dozen or so mountain hares and the off red grouse. Next stop was Musselburgh where plenty of goldeneye and a few scoter amongst the eider. We detoured home via North Pennines for black grouse one obliged by the side of the road which was luck given the heavy snow and poor visibility. One last chip stop before an uneventful trip home two fallow deer at the edge of the village as we got back to finish the trip. We were up early and at Shetland Catch fish factory here an Iceland gull was present briefly but nothing else. We headed south stopping near Leebotten for two tundra bean geese in a flock of greylag geese, a lone pink foot was tagging along as well. Next we headed to Loch of Spiggie where we had a Slavonian grebe and in the south corner the pied billed grebe. We went down to Quendale bumping into some Whooper swans. Next stop was Boddam where we had a nice selection of birds in the Voe, the pick were several purple sandpipers. The rosefinch was a no show in Cunningsburgh so we headed north a mountain hare of note. Toft was productive a partial ermine stoat near the ferry terminal was very nice as was a small flock of twite. Sullom Voe was our next stop but little of note and we headed back to Lerwick for more gulls at the fish factory. Here two Iceland gulls showed nicely along with the common species and some nice long tailed ducks. It was time for chips before getting the ferry back to Aberdeen. Another bite at the Tengmalm's Owl started with the long overnight drive to Aberdeen was uneventful as was the flight to Sumburgh. The bright green hire car was an eye sore but it got us to Tresta where the Tengmalm's owl was showing nicely in a tree. We watched if for a while in the pleasant sunshine. A quick visit to the shop for a celebratory ice cream. Then a quick visit to Kirkabister where we had great northern divers and eventually the white billed diver in very tough sea watching conditions. We headed back to Tresta for the owl, as dusk fell the owl emerged and headed out to hunt. We headed to Lerwick for chips and some sleep. I took the long overnight drive to Aberdeen and flew to Shetland, I managed to get a lift with two welsh birders Rob and Gareth in their hire car. However a tyre issue meant a car change in Lerwick was required and we were last to arrive on site, not that we were missing much. I spent all day on site but no sign of the tengmalm's owl. A few year ticks were all I could muster red grouse, fulmar, raven and hooded crow. Darkness fell with no sign and I had to fly back to Aberdeen after a disappointing day. Top thanks to the guys who helped me out with lifts most appreciated. And yes it reappeared the next morning! With the mornings and evenings becoming brighter I am commuting to and from work when it is vaguely light. I have been seeing plenty of wildlife on my commute, buzzards, red kite, a herd of 10 fallow deer, muntjac, kestrel and brown hare in the last week. I have had some incidental garden sightings of moths and ladybirds over the last couple of weeks, a pale brindled beauty of note, a brown rat in the garden and bird highlights are some reed buntings. I spent the day in the Brecks a brief stop at Santon Downham for lesser spotted woodpecker and a brief water vole. Some spring snowflake along with snowdrops nicely decorated the woods nearby. I drove some arable areas looking for deer and hares, muntjac, roe deer and a lone brown hare. I then went out of the Brecks to see a roosting Tawny owl in North Elmsham which are alway nice to see. Back in the Brecks with the masses at Lyndford for hawfinch and brambling and a lesser spotted James Hunter. I stopped off for some stinking hellebore before finishing at Lackford lakes. Here the kumliens gull and a caspian gull were the highlights. Finally finished my weekend working so have more time for wildlife and I started by driving overnight to Scotland, after a brief nap, I found myself at Loch where a nice redhead smew was present but the ducks were nervy and with no cover along the Loch the chance for photos was minimal so I headed off to Troon. Here was a nice selection of pipits showing nicely apart from the water pipit. Eventually I located it and in between the dog walkers, and other beachgoers I managed a couple of photos. I headed off to the main event the release of the Ivory gull. About 100 people had congregated at Stevenston Point for the release of the recuperated adult Ivory gull. It hopped out of the box onto the grass before flying round then flew into the bay. The resident gulls gave it a bit of a hard time and we got some more flyby views before things settled down and it preened in the bay until I left. I took a pre work walk for an hour or so in the Brecks, the weather was poor and the only thing of note was a hawfinch. I spent the morning at Santon Downham, here a rather nice Great Grey Shrike was present but I first took a wander and manged to locate a lesser spotted woodpecker and several water rails. Mandarins were of note but not much else so I headed for the Shrike which showed very nicely just north of the railway. I spotted some annual knawel plants on the walk back to the car so will need to pop back when it is in flower. I went home via Bury St Edmunds where the small group of waxwings showed nicely, however urban birding always has its issues and there were some complete tossers clearly not happy at the presence of 4 birders. 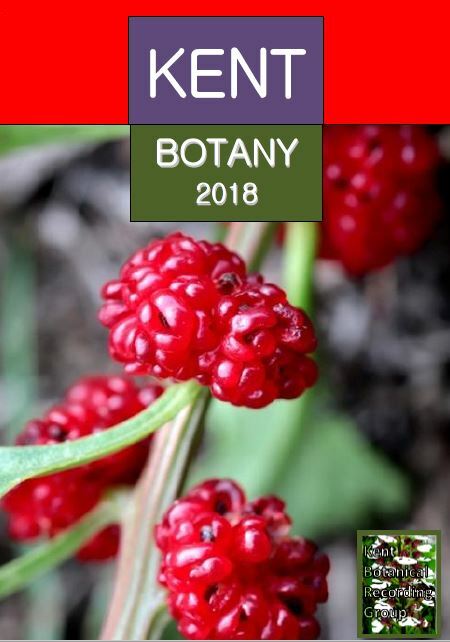 I am very lucky to have my joint discovery of Leafy Goosefoot described in this report and it features on the cover (not my photo). I was given the site for another plant dwarf mallow which I was keen to see, duly found I bumped into a goosefoot which I could not ID, I thought it was possibly Strawberry Blight (a similar goosefoot species). Dave visited the site and corrected the identity. Many Thanks to Dave for sorting the ID and submitting the record. I managed a couple of hours before work in the Brecks but although a lovely morning but I had no luck with the Shrike or any otters and only the briefest view of a lesser spotted woodpecker. But a kingfisher, bullfinch, brambling, water rail and thousands of siskin of note. I am working pretty much every day in January so when pretty much all of Cambridgeshire's Crane population was spotted together I finished work early and headed over to Manea. On arrival 42 cranes were visible and a fly over of another 4 made 46. I think a couple more have been counted in subsequent days but still 46 was pretty amazing to see. I stopped to see a flock of whooper swans and managed to locate one Bewick's as well. I finished the day at Burwell, no owls were present abut 16 roe deer and the common bird species. I headed to Huttoft Bank for the Dusky Warbler, a barn owl and three roe deer of note on the journey up. I was first on site but a handful of people joined me in the search. After about an hour it was located. It showed briefly a few times and was always moving keeping low in the ditch sheltering from the strong winds and no chance of a photo. We followed it up the ditch but lost it and I did not see it again, despite the bird news messages it never showed well. I headed for Kirkby on Bain but the assembled birders could not find the American wigeon, probably sleeping somewhere out of view. I finished the day at Frampton Marsh nothing of note but the golden plover roost was excellent but the day felt a little flat, at least the chips had improved. I have always been interested in all wildlife but have historically concentrated on mammals, birds, butterflies and dragonflies in the main, but over the last few years I have diversified into different taxa. I started with ladybirds, bumblebees, whitebeams and a few families of plants and latterly continued into more plants, fungi and other insect groups. Starting from a low base is quite difficult but many people have helped me with information and guidance and identification. I am not going to name people here they know who they are but I just wanted to thank all the people who have helped and continue to help me. I was working today, good job it was quiet at work and I could take it easy as I was still not well. I went out to the car around lunch time to get my lunch and saw the resident stoat. I grabbed the camera and followed him and got a few decent views before he eventually gave me the slip. But I am always pleased to catch up with them. Just before Christmas I got the eagerly awaited "Field Guide to Ladybirds of Great Britain and Ireland" from Helen Roy and Peter Brown, and nicely illustrated by Richard Lewington. We have been waiting for a propper field guide to ladybirds for ages particularly for the 25 or so cryptic species which cause us such headaches identifying them. The cryptic species until now only had scientific names but we have some names for them and some are very similar to our local names but a few we were well off the now official names. The book is good I would have liked a little more on how to separate some of the similar looking cryptic species and I think the life size pictures are actually too small. Also as with books it is going out of date one species mentioned briefly in the back I have seen and there are loads of records going back a couple of years so this species could have really made the full species section. 8/10 and much better than anything else available. I was up early, but halfway to the North Norfolk coast I had to stop for some sleep. I have been ill for days and hardly slept and was struggling. The trip was eventful, fallow deer and muntjac, barn owl and a brown rat in a layby. I eventually made it to Burnham Overy dunes, a brown hare crossed the track on the walk down but I was here to look for dwarf and tiny earth stars which I did find along with another unidentified earthstar. Plenty of geese were present White fronts, Barnacle, Brent, Egyptian, Pink foot and greylag. I made it back to the car and for a well-earned rest along with a selection of medicines. Next I headed to Wells but stopped along the way for some Bar headed geese which were rather unexpected. Wells had a distant male hen harrier a glaucous gull and a guillemot resting on the shore in the harbour. I headed to Burnham Market for the first chips of the year but was very disappointed they were terrible. I was still feeling terrible so headed for home rather than Titchwell as was my original plan. I stopped for a break and saw the message about the white headed duck not too far from home so went via there for a quick look before heading for my bed. I managed to get up from my sick bed for a couple of hours to visit south Lincolnshire to see Martin's Ramping fumitory a rather rare plant. It was the first of this years project to photograph 100 new plants Keep an eye on progress on the sidebar. I also found a couple of earthstars, one unidentifiable the other probably striated. No Chips on New Years Day they always seem to close up. Another great mammal year with some amazing encounters particularly with two new UK mammals Orca that were amazing and the long staying Beluga totally unexpected. Brilliant Edible dormice, a Leisler's bat were worth mentioning and my second Bearded seal was also very nice to see. Probably the A total of 50 species in total (48 photographed) which makes the 11th year in a row exceeding 50 species, I won't try for 50 this year as I think I have demonstrated that 50 species in a year is now easily acheivable, but I will keep a list. A poor bird year with only 203 species seen, as I focussed on other taxa. Some highlights were ptarmigan, white winged scoter and pomarine to name a few. New species were a bit thin on the ground and I only caught up with Grey Catbird, Moltoni's Warbler, Stejneger's stonechat, I must do better but work kept getting in the way of twitches. Following up on my other areas of interest I had a great year with some nice new Ladybirds the highlights were False spotted and Black scymnus, other highights were a Oleander hawkmoth, thrift clearwing, Beautiful Marbled and tree cricket I finally got my last Whitebeam the localised Llangollen Whitebeam. Several broomrapes and a whole selection of nice plants and a few rares such as Shetland Mouse ear, ox tongue broomrape, sand catchfly, sulphur Clover, Greater Broomrape, Deptford Pink, South Stack Fleawort, leafy goosefoot. I also caught up with some cool fungi, white cage fungus the pick. Trip wise it was busy with two weeks in Sri Lanka and Dubai where we had over 280 species of birds and 70 species of mammals, including some crackers like red slender loris and Bryde's Whale. A trip to Israel was eventful and we caught up with the uber rare Persian Fallow Deer. A week in Scotland mainly Shetland for local specialities such as Orca, oysterplant, Shetland mouse ear. 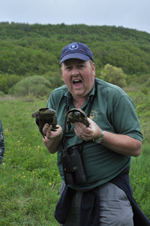 I also joined the Dutch Mammal Group for a trip to Romania where Romanian hamster was the highlight. Copyright © 2017 Mark Hows.